The Eau Claire Amateur Radio Club Volunteer Examination Team was formed by Steve Bluem KA9OMY and Jim Staatz KI9H (sk) in 1989. Since then ECARC has administered examination sessions. 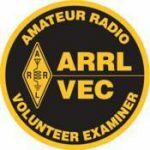 All volunteer examiners hold amateur Extra class licenses and are certified by the American Radio Relay League and the Federal Communications Commission. exam teams will only accept a valid FRN on your application. Check with your local exam team before exam day. our Obtain License Copy web page. 6. Two number two pencils with erasers and a pen. 7. A calculator with the memory erased and formulas cleared is allowed. You may not bring any written notes or calculations into the exam session. the exam session and the phones’ calculator function may not be used. 8. Bring a check, a money order or cash to cover the exam session fee(s). © 2019 Eau Claire Amateur Radio Club Inc.